Surface trap fabricated by Sandia National Labs, supported by IARPA. This type of trap has been used to capture ions at JQI and Duke University, as well as other institutions. (Contact JQI for permissions). IARPA awarded the Duke/Maryland/Georgia Tech partnership a five-year, $31.9 million grant through its program dubbed LogiQ. Their goal is to bring together a large number of atomic qubits to realize modular “super-qubits” that can be scaled up while correcting for errors. This major multi-year award is led by Jungsang Kim (Duke University), Christopher Monroe(University of Maryland and the Joint Quantum Institute) and Ken Brown (Georgia Tech). 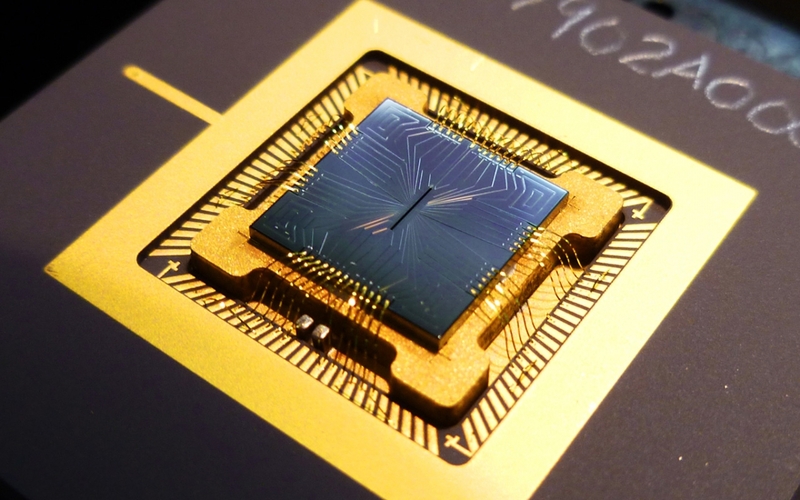 *The University of Maryland is home to three quantum science research centers: the Joint Center for Quantum Information and Computer Science (QuICS), the Joint Quantum Institute (JQI), and the Quantum Engineering Center (QEC). *Duke University houses Fitzpatrick Institute for Photonics, an extensively interdisciplinary effort to advance photonics and optical sciences at the boundary nexus of nano-bio-info-opto convergence, and the Multi-functional Integrated Systems Technology group.